Metro station: Malostranska (line A). Then either walk up Stare Zamecke Schody (Old Castle Steps), or take tram 22 to Prazsky hrad and walk through the Prague Castle complex. The highly acclaimed Lobkowicz Palace (Lobkowiczký palác) is part of the Prague Castle complex. The palace is open to the public, operating as a museum. It's finest room is the intimate setting for a lunchtime classical concert. After 40 years of Communist rule, and a further 12 years seeking its restitution, the Lobkowicz family finally regained ownership of their palace in 2002. They then embarked on an extensive programme of renovation. Lobkowicz Palace is now a wonderful building to visit, as the rooms are filled with exhibits drawn from the private collections of the Lobkowicz family. Your personal audio guide leads you through the palace, allowing you to browse at your own pace. There are works of art by 12th-20th century painters, including stunning masterpieces by Canaletto, Brueghel the Elder, Velazquez and others, plus weapons and ceramics collections, musical instruments, and rare manuscripts from Mozart and Beethoven. The Lobkowicz family are very musical. Lobkowicz Palace was built in the 16th century by Czech nobleman Jaroslav of Pernštejn, and was originally named the Pernštejn Palace. It entered the Lobkowicz family by way of marriage. Over the centuries the palace has played a part in some of Bohemia’s significant historical events. 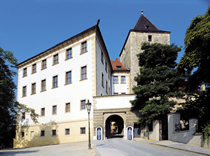 For example, in 1618 when Protestant rebels threw their Catholic Imperial ministers from the windows of Prague Castle (the “defenestration”), those surviving the fall were allowed to take refuge in the adjoining Lobkowicz Palace, at great political risk to the family. Although Lobkowicz Palace has undergone changes over the years, all periods of its architectural history survive. Of particular note are the palace chapel and the magnificent reception rooms: the Marble Hall, Balcony Room and the Concert Hall. Visitors can experience the true splendour of the Concert Hall by attending one of their classical concerts. These run daily at lunchtime and can be booked through Prague Experience (see below). During your visit you may also wish to enjoy a drink in the café. Fine views over the city can be enjoyed from its balcony. Lobkowicz Palace museum ticket includes an audio guide in Czech, French, English, German, Italian, Japanese, Russian or Spanish. The tour lasts one-hour, but take longer if you wish. Senior/Student/Child (7-15 yrs) 200 CZK. Family (2 adults + 2 children) 690 CZK. Buy tickets at the palace on the day - advance reservations are not necessary. The Concert Hall at Lobkowicz Palace is the delightful setting for lunchtime classical concerts, which run daily at 13:00. Prices: 390 CZK & 490 CZK. Buy tickets from Prague Experience via our concert listings: Search the listings for the day you wish to attend, then click book. Listings and tickets: Book Concerts. Our package combines the Lobkowicz Palace museum ticket (including audio guide) with the lunchtime classical concert. You can visit the palace any time from 10:00-18:00 on the day of the concert. The package is priced at a discounted rate to buying separate museum and concert tickets. Prices: 590 CZK & 690 CZK. Book Palace Museum & Concert Package. We highly recommend the concert, and the museum and concert package. Both present superb value for money, and could prove to be a highlight of your trip to Prague.